Tom Spivey lost 30 lbs. 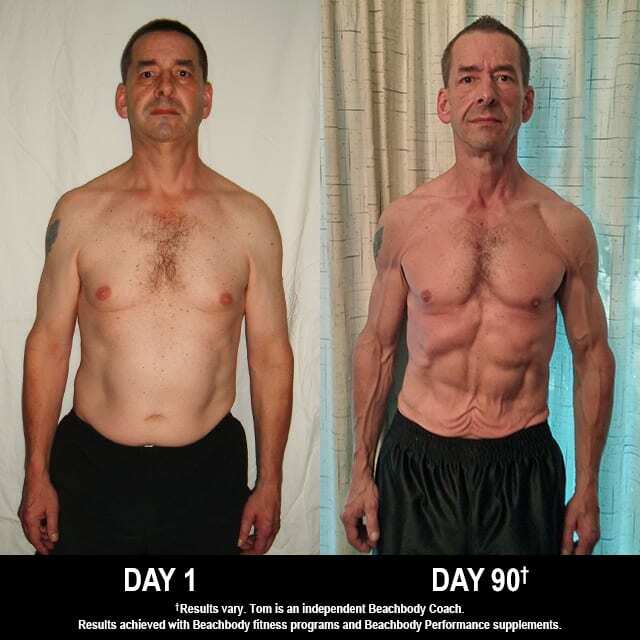 in 90 days with Body Beast, Shakeology, and the Beachbody Performance supplements. He entered his results into the Beachbody Challenge, and won the $500 Daily Prize for November 30th! I felt tired and sluggish most of the time. With over 25 years of careless eating habits and only sporadic exercise, I watched and felt my strength deteriorate. Routine tasks were becoming increasingly more difficult. I was a bit self-conscious about wearing a swimsuit at a pool or beach. Whenever I caught a glimpse of myself shirtless, I could only shake my head in disappointment at what had become of my once athletic body. Although considering the aforementioned unacceptable and getting a doctor’s warning about high LDL cholesterol levels, I kept putting off doing anything about it for another week, another month, another year. What finally pushed me into taking action were the results of a medical screening earlier this year indicating a mild/moderate plaque build-up in my carotid arteries.3 I’d been working toward a retirement I may not live to see. It had to be now — or never. Not knowing how to proceed. I had no organized plan for exercise and nutrition. Then I happened to see an infomercial for Body Beast, and it looked like something I’d be interested in, though I was concerned I might be too old for it. Several things were mentioned that resonated with me. “Any age,” and, “We’ll tell you what to eat, and when to eat it.” The information on applied nutrition was the missing piece for me, and by itself is more than worth the price of the program. The combination of weights and cardio. Sagi is challenging, motivational, and inspirational. From the proper nutrition plan, to the dynamic set training, to the crunching guitar and bass riffs that set the tone, this is a professional program that appeals to me in every way. I can’t get enough of it! I made it through the entire program without missing a single killer workout, and hit it with everything I’ve got. I followed the nutrition plan without cheating — no alcohol, pasta, or chocolate (other than chocolate Shakeology). By the end of Week 4, I was down to my previous best Army weight and thought it might end there. Never in my wildest imagination would I have believed that by Day 90, I’d be at a weight I hadn’t seen since I was an athlete at 15! I wanted my youth and strength back, and I was getting them in spades! I lost 30 pounds and nearly 7 inches off my waistline. I work out, drink Shakeology daily, and eat healthy, planned meals in proper portions. My attitude and outlook are much more positive as strength and mental focus have returned. I’m so excited about the possibilities that I became a Coach so I can help others achieve their fitness goals. I want others to experience this same overwhelming sense of physical and mental well-being that comes after every intense workout, and see — and feel — the results for themselves. I did not join a Challenge Group, as I was determined from the start to complete this program if it’s the last thing I ever do. Eileen Tessalone is a wonderful, positive, and uplifting Coach who provided guidance and enthusiastic support through this crucial first leg of my fitness journey. The most important thing she did was remind me at the start not to neglect the nutrition plan, after I’d told her my intention to jump into the exercises as soon as the package arrived. This caused me to study it in detail, and I realized how unprepared I was to begin. I delayed the start date four days until I had a thorough understanding of the meal plan and everything prepared. This proved critical in achieving results. I voluntarily sent her progress updates at the end of each week, and when I had questions or doubts, she made me feel like I can accomplish anything!